A healthy collard greens recipe that’s a unique vegan twist on traditional green goddess salad dressing recipes which is usually made with mayo and different herbs like parsley. This collard greens based version is as delicious and more versatile working with different proteins like fish and grilled meats, but also plant-based dishes as well. The fresh cilantro and parsley give it a bright herbal essence while the collards provide the earthy base. 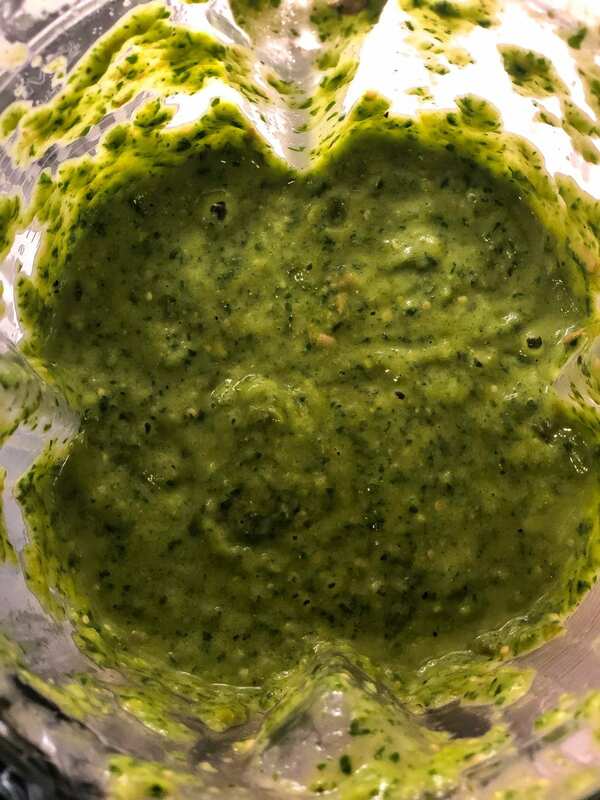 This vegan green goddess dressing is in my rotation of clean, healthy and delicious sauces that I have on hand week to week. It’s actually closer to being a collard greens salsa verde. Every Sunday as part of my weekly meal prep I make 3-4 condiments and enjoy them liberally on simple easy weeknight meals I cook. This Roasted Red Pepper Sauce and Israeli Chimichurri (Zhug) are examples. The recipe for this jar of green goodness doesn’t get much simpler; it’s just a quick blanch of the collards and then blending with all the other ingredients for a healthy way to get more collard greens into your diet. It’s 5 minutes max of your time with a super high return on investment. I know it be tempting to add more to this recipe, but really this is one of those where you just gotta trust that less is more. This recipe is the opposite of an involved recipe. Trust the process; adding a bunch of ingredients is an unnecessary self inflicted wound. Collard greens when cooked right are one of the most nutritious vegetables out there for you. They’re extremely low in calories (only 70 calories in a cup of cooked greens) assuming you don’t cook them in a vat of salt pork. They also are rich in dietary fiber, folate, and vitamins E,A,K, and C which all combine to provide cholesterol support, heart health, ease of digestion, detox support and cancer prevention. For more comprehensive details on collard greens’ health benefit visit the article 11 Health Benefits of Collard Greens. This salsa verde recipe makes it easy to enjoy these benefits on a daily basis. Let the salsa rest about 30 minutes before serving. This will allow flavors to come together. 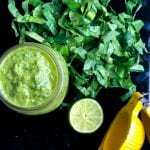 What sides or main dish recipes does this green sauce work well with? 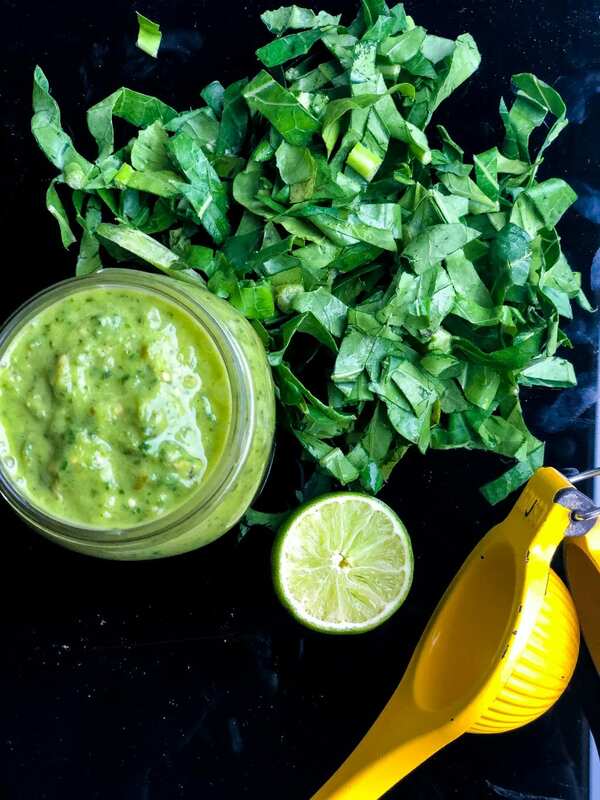 You can reap the benefits of this super green salsa verde all week on a variety of dishes. I include some specific recipe matches below, but my general approach is to drop generous amounts of the salsa on pastas, grain bowls, or grilled proteins. I tend to be more dinner focused but breast fast eggs and lunch business get the salsa verde treatment as well. Make this healthy collard greens recipe today and check back with me in a day or two for some more quick and easy ways to get more of it into your life! If you make this sauce, please come back and leave me a comment below with your feedback. Definitely take a photo of the dish and be sure to tag #foodfidelity so that I can see them. For another healthy collard greens recipe try this Pear and Fennel Salad w/ Collards. Unique twist on traditional green goddess dressing recipe. 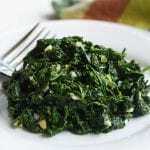 Healthy collard greens are added for a delicious and versatile sauce that works on everything from pasta to grilled meats, fish and vegetables. 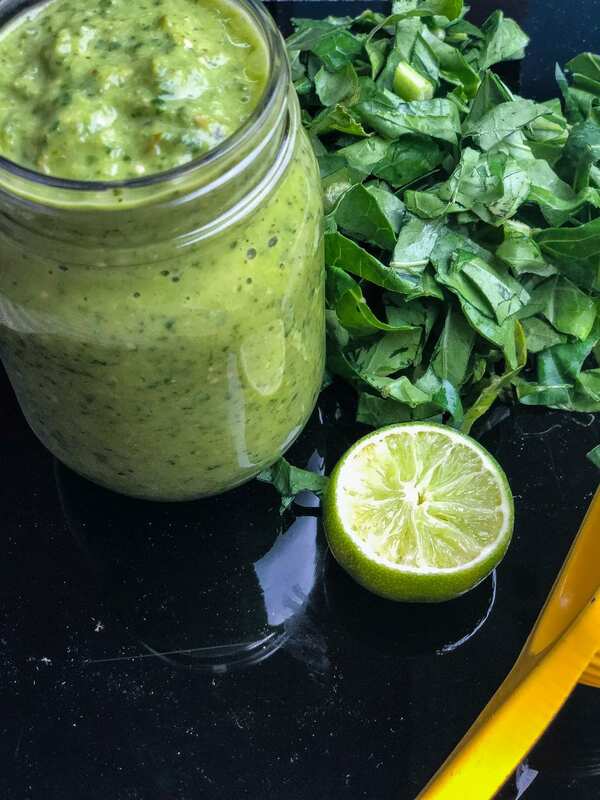 Scoop salsa verde in a large glass mason jar. Top with extra virgin olive oil to cover the surface. Secure the lid tightly and store in the refrigerator for up to 10 days. To blanch the greens bring a pot of water to a boil.While the water is heating prepare a ice bath by adding ice and water to a medium mixing bowl. Place the greens in the boiling water for 1-2 minutes then remove to ice bath to cool them down for 3-4 minutes. Drain the water, squeezing any excess water from the greens.